HQ Symphony Pro 2.5: The latest generation of the Symphony Pro series! 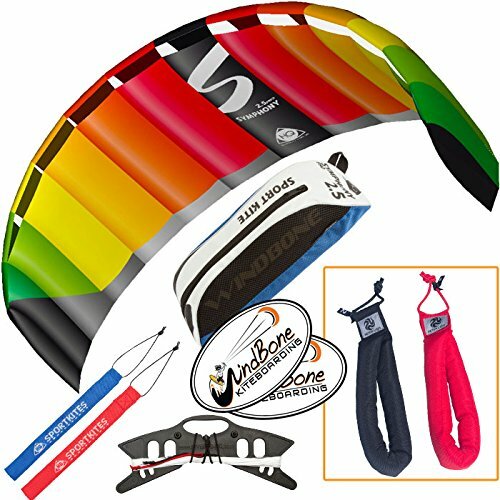 Fun for all skill levels looking for speed and power, this revised Symphony Pro is one of our favorite kites. The ram-air, frameless foil design feels solid in the air and doesn't fold on the edge of the wind. Sewn Dyneema bridles provide low-drag and strength for performance that is fast, stable and smooth. The larger sizes have impressive pull, so be prepared to lean back and hold on. A compact carrying case makes it easy to take on your next adventure. 1 Pair - Peter Lynn Heavy Duty padded kite control straps: these padded Heavy Duty straps allow you to fly and control your 2-line kite with ease and extra comfort. The padded straps are made from extra durable and comfortable webbing with foam padding inside.They can be used both as a handle and as a strap, that can be placed around the wrist to get the load off your hands when flying your kite. 2-line padded straps come as a set of two, red for left and black for right.